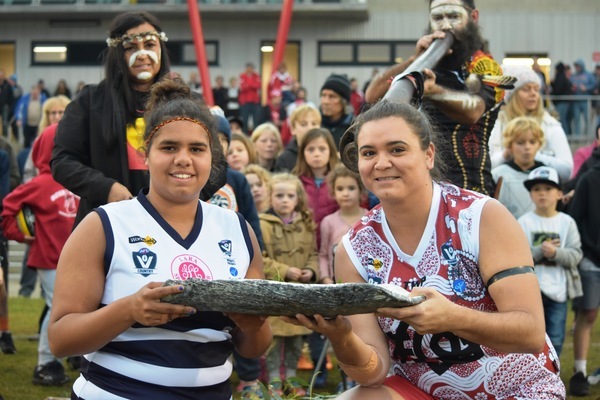 Ocean Grove Football Club senior women’s football team marked its inaugural night match with a special welcome to country and smoking ceremony as part of indigenous round on Saturday 23 June. The Grubber football women took centre stage under lights at Shell Road at Ray Menzies Memorial Oval to recognise its indigenous contributions. Both the Grubber senior men and women’s teams wore specifically designed indigenous jumpers. At the completion of the senior men’s game between Ocean Grove and Anglesea lined up side by side for the 15-minute ceremony. All players, including women’s teams Ocean Grove and Lara participated laying an eucalyptus leaf at the ceremony with many locals observing and paying their respects to indigenous cultures. “The leaf is given from the eucalypt that is on Wathaurong country – and the leaf is given as like a passport and a passage and welcoming and cleansing you on a safe journey on our country,” said Corrina Eccles, a Wadawurrung traditional owner, who conducted the ceremony on the night. The Grubbers had a number of indigenous women which played in the night game – they were Che Louise Cockatoo-Hewitt, Candice McKenzie and Mikaela Cameron. 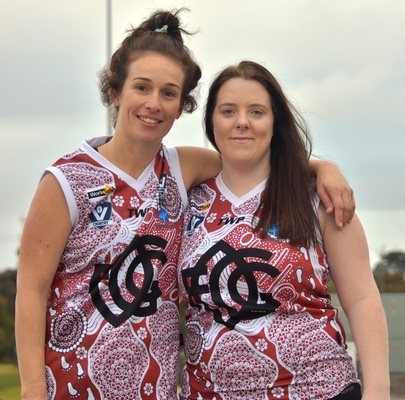 Ocean Grove assistant coach Lachlan McKenzie, brother of player Candice McKenzie, took the reins as senior coach on the night is of aboriginal descent, while Grubber water girl Bec Griffiths also has indigenous heritage.